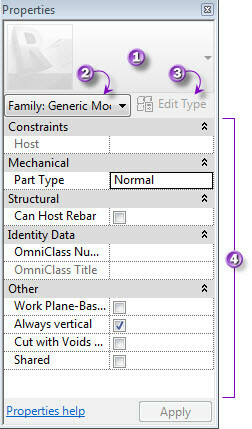 In my previous post, I wrote about Revit family classifications. Autodesk defines them as three types: system families, loadable families, and In-Place families. Loadable families and In-Place families have the same creation process and tools, and that is why I classified them under component families. In the Revit ribbon menu, you’ll see the difference in the last panel. 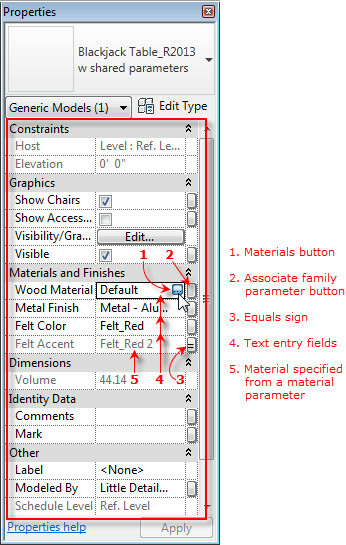 In-Place families display the green check mark and red X mark buttons in the In-Place Editor panel (see Figure 1). Figure 1. The In-Place Family Editor panel. In the separate Family Editor panel, this is replaced with a Load into Project button (see Figure 2). Figure 2. The Family Editor panel. Their only difference is where they are created from. In-Place families are created within a project (Architecture>Component>Model-in-Place) while loadable families are created in the Family Editor, outside the project environment. You could think of In-Place families as including the Family Editor in the Project interface. Contrary to some misconceptions, In-Place families can be saved as loadable families, as I’ve demonstrated in Part 1 of this series. On the other hand, conceptual massing components are also families, but created in an entirely different way. 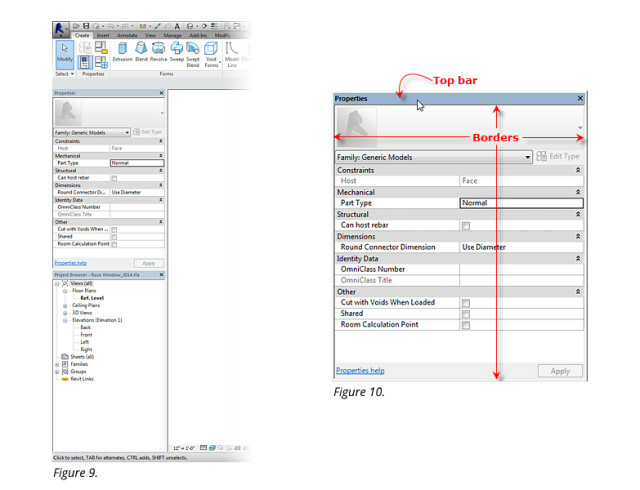 Even the ribbon menu is configured in a different way (see Figure 3). They are also loadable and can also be created in a project (Massing & Site>In-Place Mass). Figure 3. The Conceptual Massing Family Editor interface. 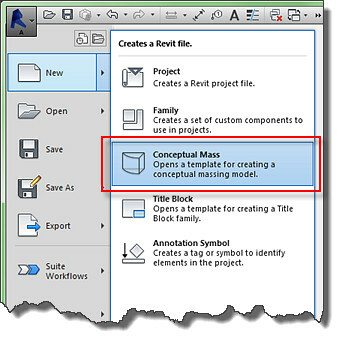 The Conceptual Massing Family Editor is a separate program within Revit, just like the Family Editor. It allows you to create massing components that can be loaded into a project and turned into building components (see Figure 4). Figure 4. A pyramid mass turned into a project building component assigned with a brick wall. 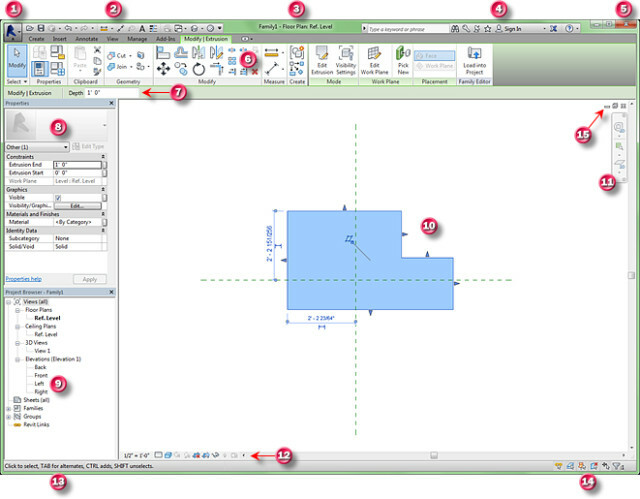 When you click the application button (the “R” Revit logo on the top left), the New fly-out menu even contains a separate button for Conceptual Mass (see Figure 5). Figure 5. The New>Conceptual Mass menu item. Now that we’re clear on this, let’s take a look at the Family Editor interface and how it’s important for you to be familiar with it in order to generate families efficiently. So far, there had been no major changes to the Family Editor interface since Autodesk implemented the ribbon menu. The Project and the Family Editor interface share similar ribbon tools. However, the Family Editor has fewer tools. The tools in the ribbon are specific to creating families. The term Family is synonymous to loadable 3D components used in other BIM software. For example, it is termed GDL in ARCHICAD. In Vectorworks, it is known simply as Symbols. Family is the word chosen by Autodesk because of the component’s relationship with the building project. You can switch between a family and a project file back and forth, just like you would in a project when you’re opening multiple views and sheets. It shows up when you click the Switch Windows button (see Figure 6). Figure 6. The Switch Windows button in the Quick Access menu. Figure 7. The Family Editor window interface. The Viewcube is added to the drawing/modeling area when the view is switched to any 3D view (see Figure 8). Application: When clicked, the pop-up menu contains common file management commands, including advanced commands such as Export and Publish. The Options button accesses the Options dialog box, which contains numerous options and preferences for customizing Revit. Quick Access Toolbar (QAT): A customizable toolbar that contains a set of default tools. Users can add frequently-used tools here and arrange them in any order. The toolbar can also be relocated below the ribbon (right click the QAT>Show Quick Access Toolbar below the ribbon). File Name: This text heading consists of the Revit version, the file name and the name of the active view. 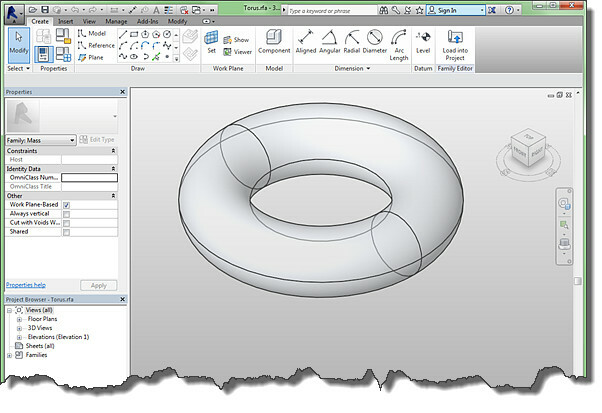 InfoCenter: Contains buttons for accessing additional information and resources pertaining to Autodesk subscription, product support and other Help files. Close button: Closes the Revit session. Ribbon: Area where the tabs containing panels and tools are located. Options Bar: Contains additional options when a tool or component is selected. It can be relocated at the bottom of the drawing area, above the status bar. To do this, right click the bar and select Dock at the bottom. Properties palette: Contains information pertaining to the current view, the family template, or the selected Revit element. It is a floating palette that can be docked and relocated anywhere on the screen. It can be left closed to gain more screen space. Project Browser: Palette shows all the views of a family file, including nested families and groups. Like the Properties palette, it can be relocated anywhere on the screen or left closed. Drawing/modeling area: Displays the file being worked on. Navigation bar: Contains tools and options for zooming, panning and orienting the current view. View Control bar: Contains tools for visualizing a model. It includes settings for scale, level of detail, graphic display options and visual styles. It also has options for saving an orientation, locking and cropping a view and temporarily hiding or isolating an element. Status bar: Displays the type and name of a selected element or nested family. It also displays hints and tips pertaining to a selected tool. Filter buttons: Tools pertaining to selecting objects. It has a filter tool button that displays the total count of selected elements, Drag Elements on Selection button and four selection tools. 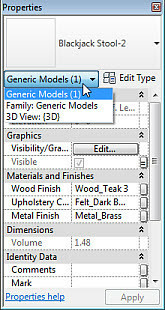 These tools select specific elements in a project and family such as links, underlay, pinned elements and face of elements. Minimize, Restore Down, Close buttons: Minimize allows a current window to be resized; Restore Down toggles the view between a maximized and minimized window setting; Close closes the current file but keeps Revit open. Viewcube: Navigational tool that can be left displayed or hidden. It is a visual indicator of the current viewpoint of a model. Clicking or dragging any of its corners, edges and surfaces rotates the model at its center point. Additional options are available when it is right-clicked. 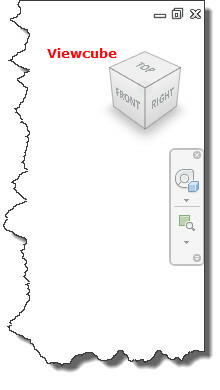 When a family template is opened, there are two windows docked on the left side of the drawing area by default. 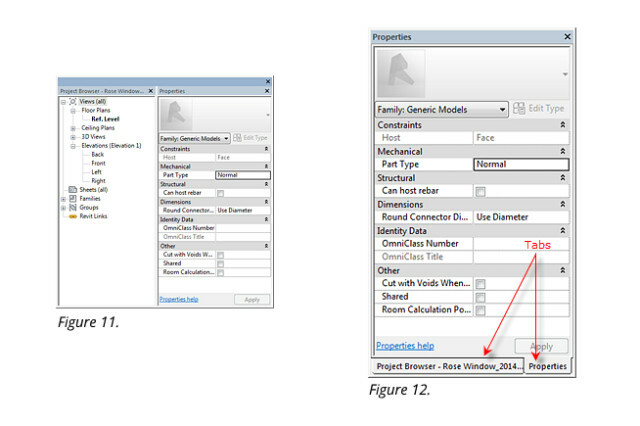 These are the Properties palette and the Project Browser (see Figure 9). Each window can be pulled out from its location by dragging the top bar as shown in Figure 10. Figure 9. The Properties palette and the Project Browser. Figure 10. The top bar can be dragged. The Properties palette and the Project Browser can be docked on the top, bottom, right and left sides of the drawing area, or left floating. They can also be placed side by side (see Figure 11), separately, or as one palette by dragging the top bar to any of the borders of the other palette. You also have the ability to dock the palettes in one window and combine them as tabs (see Figure 12). This is done by dragging the top bar of a palette to the top bar of the other palette. To separate them, simply drag the tab (located at the bottom) outside the window. Figure 11. Side-by-side configuration. Figure 12. 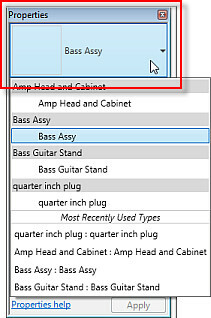 Tabs configuration. Figure 13. The four main parts of the Properties palette. Type Selector: This area of the palette remains dimmed until an element is selected and there are other elements with the same type. It then becomes a Type Selector (see Figure 14) where the name of the selected type is displayed. Clicking the drop-down arrow displays other available types. Properties Filter: This is a drop-down list (see Figure 15) containing the properties of the active view or the template being used. When an element is selected, it is added to this list by its category name. It is also a filter that displays the number of instances of selected elements. Choosing a category displays its properties while the elements remain selected. Figure 15. Drop-down list in the Properties palette. Edit Type: When an element containing Type parameters (e.g. nested family) is selected, this button becomes active. 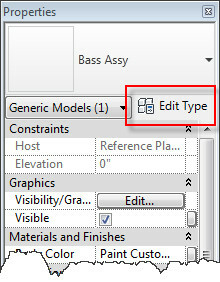 Clicking Edit Type opens the Type properties dialog box of the selected component and displays its user-editable and read-only properties (see Figure 16). The type can then be duplicated and its values can be modified. Thereafter, the new type is added to the Type Selector. Alternatively, the Edit Type button can be accessed from the Modify tab>Properties. Figure 16. Edit Type button. Instance Properties: When an element or component is selected, its read-only and user-editable properties are displayed in the Properties palette (see Figure 17). Figure 17. The main window in the Properties palette. In Figure 17, when the right side of a Material text box is clicked, a blue button momentarily appears (1). This is the Materials button. Clicking it opens the Material Browser. The little rectangular button on the right side of a text box is the Associate Family Parameter button (2). Clicking it opens the Associate Family Parameter dialog box where a parameter from the list can be associated to a selected component. A new parameter can also be created by clicking the Add parameter button (in the Associate Family Parameter window). After clicking OK, the rectangular box displays an equals sign (3). This is the Parametric Indicator. The text boxes under the Materials and Finishes heading (4) displays the materials of a selected component or nested family. Typing a material name in the text field is an alternative way of specifying a material, provided the material exists and typed as spelled in the Material Browser. Gray text (5) indicates a material associated with a material parameter. 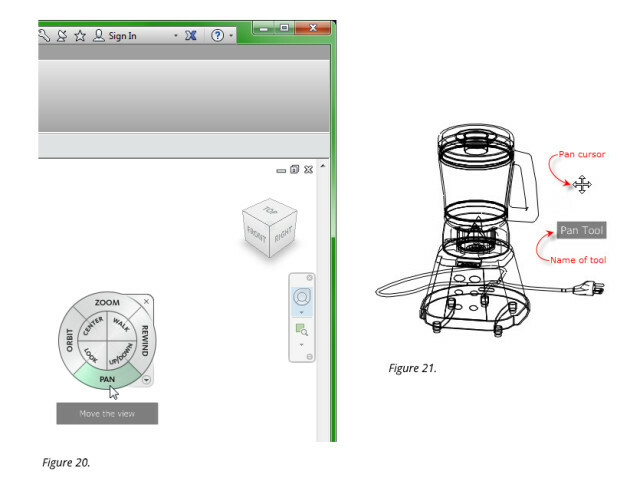 The navigation bar is located at the top right of the drawing area in 2D views (see Figure 18). In a 3D view, it appears below the ViewCube (see Figure 19). It provides additional navigation tools including Steering Wheel tools and Zoom tools. Figure 18. The navigation bar. Figure 19. The navigation bar in a 3D view. 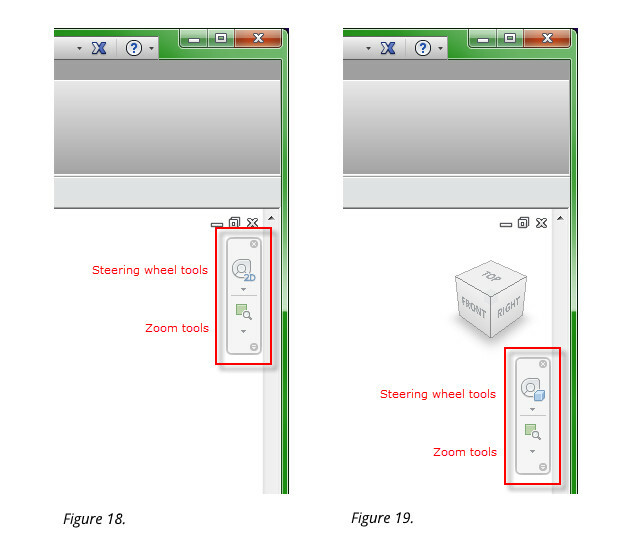 The Steering Wheel is a tracking menu that follows the cursor when the tool is accessed from the navigation bar (see Figure 20). It combines the common tools in the navigation bar into its interface. 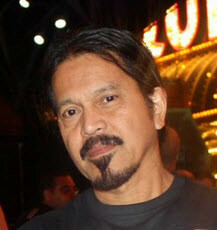 Depending on the current view, its appearance changes. To use it, the wheel is dragged over the model where the cursor is placed above the desired wheel command. Left-clicking and dragging the cursor over this command causes the wheel to temporarily disappear, replaced by a different cursor representing the command. Below this cursor is the name of the tool (see Figure 21). Figure 20. The Steering Wheel. Figure 21. The name of the navigation command. It would take hundreds of pages to explain all the parts in the Family Editor’s interface. I only emphasized the Properties palette and Project Browser because you’ll be dealing with them all the time. In your spare time, spend some time familiarizing yourself with the buttons in the ribbon menu. Experiment with the Properties palette, the Project Browser, the View control bar, and the navigation bar. Draw simple shapes and try out the tools in the menu. Boring as it may seem, if you always keep in mind that Revit is the main software used in your livelihood, then invest time in learning it. BIM is here to stay and if you want to be part of the scene for the next decade or so, learn Revit!